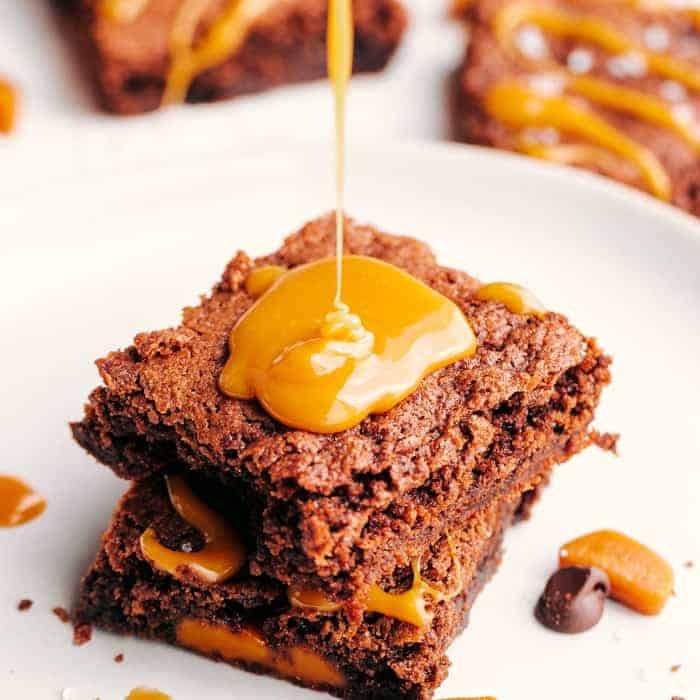 Salted Caramel Brownies are going to be the best dessert that will melt in your mouth. Full of chocolate, caramel, with a dash of sea salt, these brownies are a ooey gooey dream come true. We are obsessed with all things salted caramel! Our Slow Cooker Apple Bread Pudding with Salted Caramel Drizzle, is the perfect Fall Dessert (or really anytime dessert!) Wanna skip the rest and go right for the caramel? How about these homemade Salted Chocolate Covered Caramels. After all, sometimes we are just looking for something to put the salted caramel on – just go right to the source! Hi everyone Shannon here from The Food Cafe and if you have never had a Salted Caramel Brownie be prepared to be in love at first bite. These brownies are not made from a box, and yet are simple and easy to make. 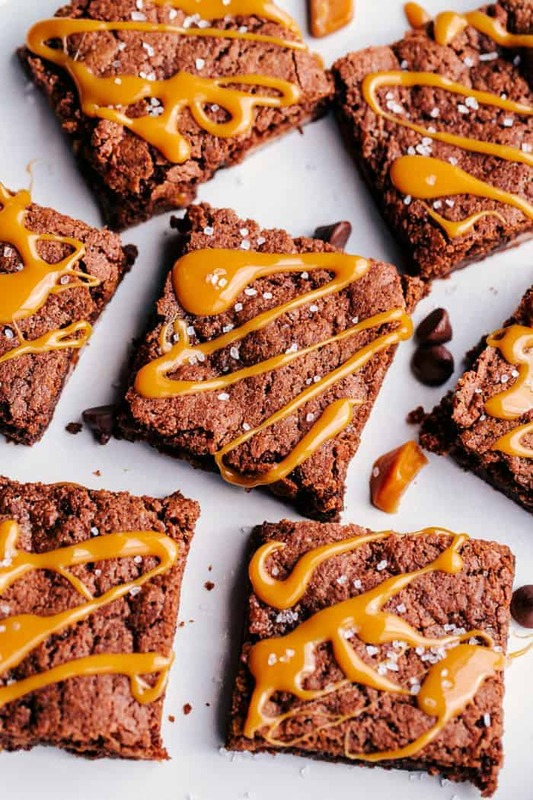 Salted Caramel Brownies are loaded with semi sweet chocolate chips, delicious chewy caramels and topped with a warm gooey caramel sauce and small flakes of sea salt. 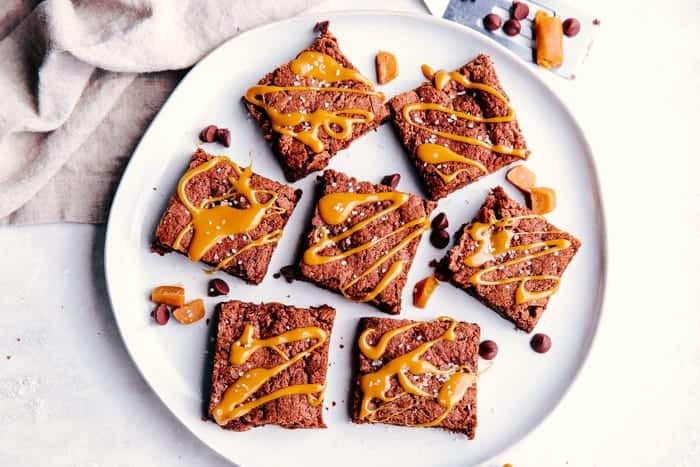 All hail to the chocolate lovers out there or those who desire to be, you are going to love these sensational Salted Caramel Brownies at first bite. Did you know that the opposite of a brownie is a blondie? If you ever want to shake things up, we have the most delicious blondie recipe! Looking for something else to “stuff” your brownies with? We made these amazing Peppermint Patty Stuffed Brownies – if you like mint chocolate anything, you will love this easy brownie recipe. Or is you are just looking for an easy dessert, this is the Best Texas Sheet Cake Recipe EVER! What is a chocolate brownie? A brownie is dessert that is usually baked in a square shape. Brownies can include nuts, chocolate chips, cream cheese, candy, cookies, and so much more. They can be chewy, fudgy, and cake like. Have you ever been cooking or baking and something goes slightly wrong but turns out to be amazing and you have created something even better than intended? 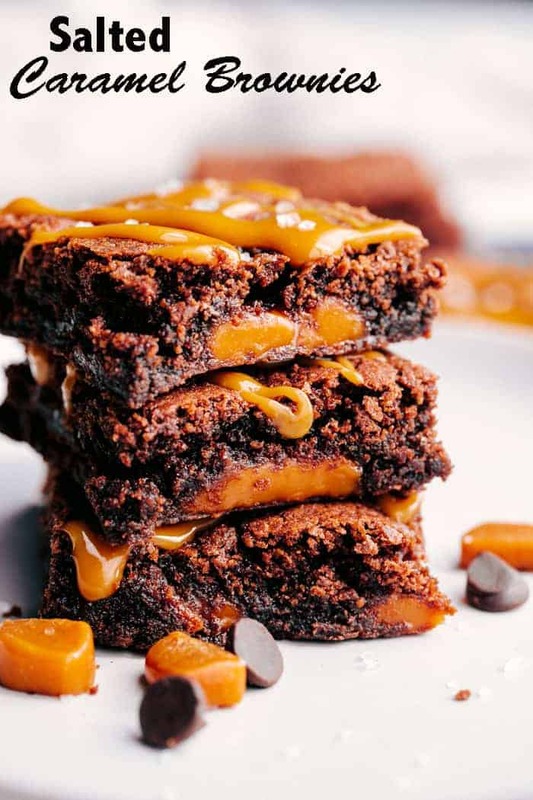 Well that is exactly how the brownie came to light, by a simple mistake, we now have chewy, fudgy, warm and gooey Salted Caramel Brownies to put smiles on our faces. 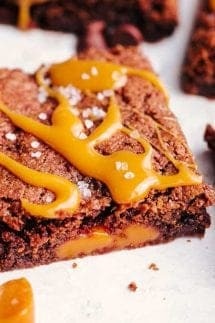 How do you make Salted Caramel Brownies? Over medium heat melt chocolate chips and one cube of butter, stirring often. Remove from heat and add in flour, sugar, eggs, baking soda, and vanilla. Stir to combine. Pour into a lightly greased 9×13 baking pan. Space caramels out evenly amongst brownie batter and gently push them into it. Bake for 20-25 minutes. In a small saucepan add remaining caramels and 3 tablespoons of heavy cream. Melt caramels over medium heat stirring often until it forms a creamy consistency. 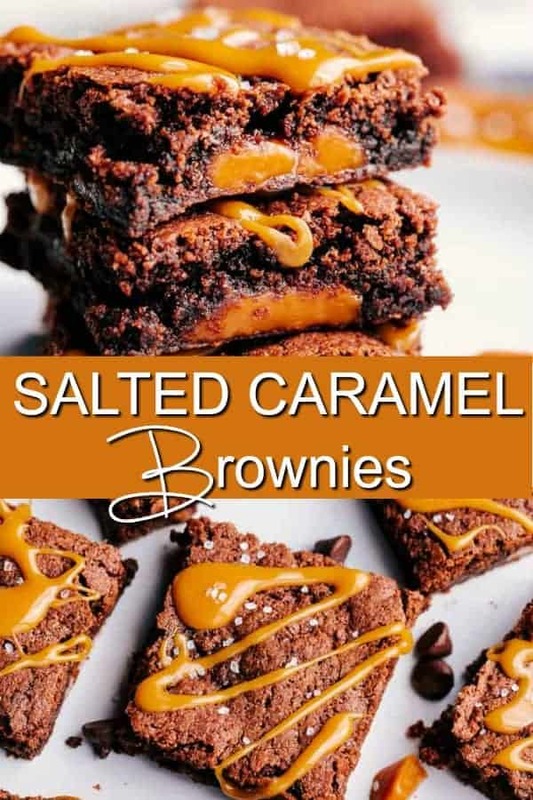 Drizzle over the top of warm brownies and add a dash of sea salt flakes before the caramel sets. Cut into squares and enjoy. Do you have to make your own caramel sauce? No. You can buy caramel sauce and drizzle over the top if you prefer or are short on time. I would recommend warming it first and then adding it to the top of the brownies. What is the difference between a baking pan and a baking dish? A baking pan is dark in color and resembles a metal pan. A baking dish refers to a glass or ceramic dish, that is oven safe. Salted Caramel Brownies are the perfect dessert to for your kids first day back to school. Or they would be a huge hit if your kids brought them to school for their birthday or school celebration. Brownies are one of those desserts that just put a smile on our faces and happiness in your hearts. Where there is a brownie, there is love. So put a smile on your kids faces and even your own, these Salted Caramel Brownies are calling your name and waiting to be enjoyed by all. PREHEAT oven to 350 degrees. Lightly Grease 13 x 9-inch baking pan. Melt chocolate chips and butter in large, heavy saucepan over low heat, stirring constantly until smooth. Remove from heat and stir in eggs, then add flour, sugar, baking soda and vanilla, stir well. caramels into batter. Bake for 20 to 25 minutes. In a small sauce pan melt remaining caramels with heavy whipping cream. Stirring often. Once a smooth consistency has formed drizzle over the top of brownies and sprinkle with sea salt flakes. Cut into squares and serve. Seriously the most mouth watering dessert ever. What is not to like about brownies with caramel! Do you use 1 cup or 1 pkg of chocolate chips?